A diner in Winston-Salem, North Carolina is giving a 15% discount to customers who openly pray over their meal. 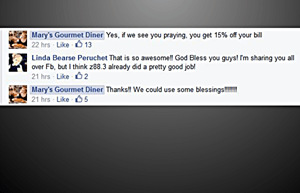 Mary’s God-met Gourmet Diner has confirmed the practice and that they throw in the “public prayer” discount all the time. Jordan Smith, who had traveled to Winston-Salem for a business trip and stopped for breakfast at Mary’s with two colleagues Wednesday morning where they “prayed over our meal and the waitress came over at the end of the meal and said, ‘Just so you know, we gave you a 15% discount for praying,’ Smith shared a photo of the receipt on her Facebook page. A mutual friend then posted the pic on the page of an Orlando Christian radio station Z88.3 and has since been shared more than 1,700 times as of Thursday afternoon. So head on down and pray. But to who you pray to and for what you pray for is up to you.